On this date in 1683, Andrew Guilline (several different spellings of his surname are possible) had his hands chopped off and then his head too, for his part in the Covenanter assassination of the hated Archbishop Sharp four years earlier. To refresh the reader, Sharp was a former Presbyterian minister who accepted King Charles II’s appointment to be the face of Stuart religious policy in Scotland, thus earning himself a comfortable state pension and permanent lodgings in Hibernian galleries of villainy. The Covenanters who made so many martyrs in these years were so known for their demand that the king honor his pre-restoration “covenant” to promulgate Presbyterianism; that Sharp associated himself with the sovereign’s volte-face made him a traitorous figure in their eyes. He’d been subject to assassination bids for years. And our man Guilline was present on the afternoon of May 3, 1679 when one finally succeeded. And after that struck off his head. His body on a pole did hing. For vengeance on Christ’s enemies. Be that as it may, Guilline was also immediately sought as a conspirator. He found it prudent to up stakes from Magus Muir and take his weaving business elsewhere. In 1683, he caught the eye of a minister at Cockpen, near Edinburgh, on account of shirking his legal duty to attend the official church services. 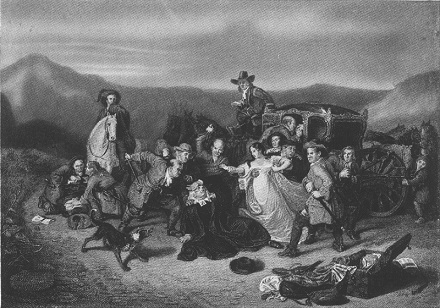 It was behavior characteristic of Covenanters, and during the years since Sharp’s murder the persecution of Covenanters had sharply intensified. The sniffing around that ensued uncovered his more infamous association, and it was this that Guilline was charged and condemned for, his sentence augmented with a demonstrative pre-execution severing of his heretical hands. There is a great confluence come here at this time; I wish with all my heart they would get good by their coming. I am come here to lay down my life. I declare I die not as a murderer, or as an evil doer; although this covenant-breaking, perjured, murdering generation lay it to my charge as though I were a murderer, on account of the justice that was executed on that Judas [i.e., Archbishop Sharp] that sold the Kirk of Scotland for 50,000 merks a year. And we being bound to extirpate Popery and Prelacy, and that to the utmost of our power, and we having no other that were appearing for God at that day, but such as took away his life; therefore, I was bound to join with them in defending the true religion. And all the land, every man, was bound in covenant, when he had sold the Church they were bound, I say, to meet him by the way, when he came down from London, and have put him presently to the edge of the sword for that heinous indignity done to the holy Son of God. But it is (alas!) too apparent that men have never known God rightly, nor considered that He is a holy God. Oh! terrible backsliding, they will not believe that God will call them to an account for what they owed to God. But assure yourselves; as He is in heaven, He will call every one to an account, how they have stood to that Covenant and work of Reformation. I need say no more; but I would have you consider, that in breaking the Covenant, we have trampled under foot the precious truths of Jesus Christ. Now, being straitened of time, I must leave off writing. Wherefore, farewell holy Scriptures, wherewith my soul hath been many a day refreshed. Farewell sweet societies with whom I have been, whose company was only refreshful to me. Farewell my mother, brethren, sisters, and all other relations. Farewell all earthly pleasures. Farewell sun, moon, and stars. Welcome spirits of just men made perfect. Welcome angels. Welcome Father, Son, and Holy Ghost into whose hands I commit my spirit!